As children become verbal they will change their own voices when they talk to infants too. From early on, young children have an understanding that the tone and rhythm of language for babies should be different. Parents who continue to use baby talk with their toddlers will find that their children begin to disengage or even ignore them. Toddlers feel disrespected when you use a type of language meant for babies. It is important to talk with your older infants, and toddlers in a normal tone of voice. The same tone you would use with adults. We have a tendency to think we need to keep it short and simple when we talk to our young children. Many adults think if it is simple it is easier to understand. In truth, simple sentences bore toddlers. Simple sentence talk about obvious things, in a way your toddler is already familiar with. Toddlers are working on learning and improving their own language. Which means, they are paying very close attention to the way you speak. They are listening for new words and ways to say things. The more complex your sentence structure is, the more focused your toddler will be on what you are saying. For example, lets say you see a cat in your yard and you want to show your child. You could say, "Look, a cat! The cat is walking in the yard. It is a white cat." Your child will look, but will be more interested in what they see verses what you are saying. On the other hand if you say, "Look, there is a white cat walking in the yard! I wonder what the cat is doing? I think it is looking for food. What do you think?" The more complex and thought provoking the conversations you have with your child, the more interested they will be in listening to what you have to say. Remember, you are modeling the use of language. Always strive to use language a few steps above what your child is able to use. It shows them how to improve their own language, and it communicates a belief in your child's ability to understand. And children do understand. By about 8 months children have close to 100% comprehension. It is important to find the balance between complex structure and appropriate content. The content of the language needs to be based on what your child can experience with their senses. Ideas like fairness, gentle, and 5 minutes, for example, are too abstract. If your child is pulling the dog's hair for example, saying, "Be gentle," only expresses and idea. It doesn't actually give them anything they can do. For our young children to follow a direction, we need to break the abstract idea down into the physical experience. Tell your child to be gentle with specific descriptions of what being gentle actually looks like. You could say, "Keep your hands open, and move them slowly when you touch the dog." Be careful not to confuse abstract with big words. The word alphabet is a big word, but it describes a thing. You can show a child a picture of the alphabet. Abstract words are ones you can only show a picture of someone doing or being. We can't show a picture of sharing, only one of people in the act of sharing. This is an important difference. You want to avoid the abstract, but fill (or infiltrate) your child's language with big words. Introducing lots of words and increasing your child's vocabulary is important for literacy, and better communication. The children's picture book series, Fancy Nancy, is a great example of using big or fancy words. Longer words with more syllables are just like every other word they are learning. It is just as easy for a child to learn the word pink, as it is to learn the word magenta. Early exposure makes the longer, more complex words more accessible and less intimidating when your child starts reading. It is also hilarious to hear toddlers use big words. Your toddler is a very smart, language learner who wants to hear all the possibilities language has to offer. 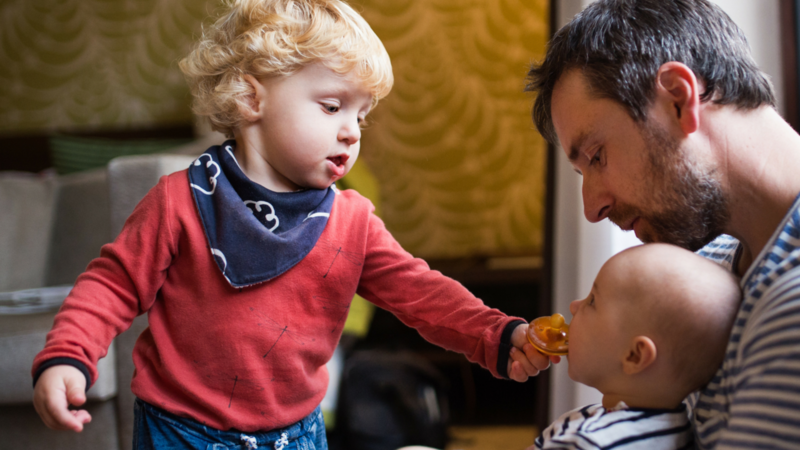 Limiting your language to baby talk, only undermines your child's learning. It also is too simple for them to want to pay attention to it. You do need to be careful in the content, especially when you are giving directions. But really, just talk to your child like you would talk to anyone.